24 Months - $33.99 Only 5 left! Toddler (3T-4T) - $46.99 Only 9 left! $13.99Green Foam Light Up Glow Stick - 18"
We are not sure that you’ve heard yet (we know it can be tough to keep up on trends with an energetic little toddler at home), but green is basically the new black. Everyone is going green lately! Which is great news for you, always the environmentalist. Just remember that whatever “green” may mean to you--reusable shopping bags, cars with fewer emissions, lower wattage bulbs, saving the polar bears, composting, or biking to work--to your kiddo green probably means one thing: the best crayon in the box. When your little Monet is around, EVERYTHING gets colored in green--Santa, the ocean, a lion, the moon. How about your two join forces this Halloween and your kid can “go green” in their own way with this Toddler Green Crayon Costume? It’s colorful, comfortable, and creative, and will help your toddler stand out this Halloween! 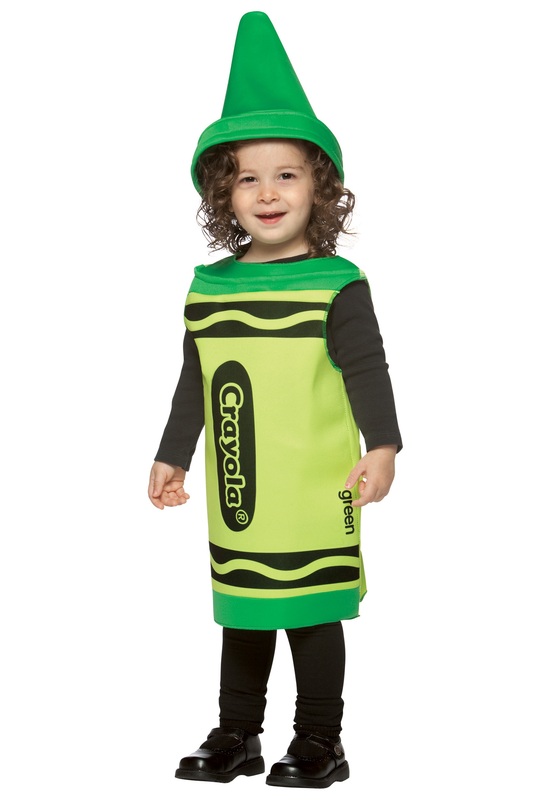 Did we mention how easy this officially licensed Crayola costume is to wear? We know that is probably important for you as your little one is constantly on the go. The polyfoam crayon just slips right over their everyday (green, probably) clothes while the headpiece sits right on their head and looks just like the tip of the green crayon. When it comes to Halloween costumes, this unexpected little ensemble may help your kiddo to realize the fun in coloring outside the lines--just so long as the crayon is green and the paper is recycled!